Many y ears ago, when the phone rang, we eagerly picked it up. That was then. For good or ill, families want to text, message and chat. And the phone call has turned into a source of harassment and scams. Robocalling is a modern torment, sometimes multiple back-to-back dials from the same source, often spoofing our own cell phone numbers – where answering the phone puts us on a ‘sucker list’ sold to other scammers. 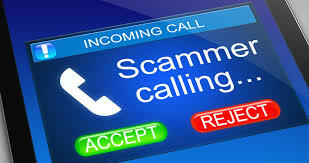 Is it Rachel from Cardmember Services or the IRS Phone Scam, a fake carpet cleaning offer or worse, the disabled veterans scam, or the grandparent 'this is your grandson' scam? The list of scams is long – the solution list is short. The National Council on Aging (NCOA) offers up an intriguing set of scams (a.k.a. crimes) like the two-person ‘pigeon drop’. AARP’s list of suggestions is simple and even patronizing: "Stay alert" and "Give them nothing." The FTC advice includes "don’t pay for something that is a free gift." And then there’s advice from the Association of Certified Fraud Examiners (ACFE) – which is nothing more than the list from NCOA. The New York Times list offers up a 'Can you Hear Me' recommendation to reply "I can hear you" versus saying “yes”, which is recorded for other fraudulent uses. Scamming of the elderly is now a $37 billion industry. Scam revenue (and some say underestimated) has reached $37 billion annually – making scamming the elderly an industry that attracts new and creative entrants on a regular basis, equal in revenue to book publishing industry. New scams appear and can be especially devastating – like the cell phone port-out scam (saying your phone was stolen and needs to be 'ported' to another device.) Or scammers grabbing that 'send a text message identifier' used to confirm a financial transaction. What are the carriers doing to prevent phone-based scams? Not much – according to consumer advocates. Despite complaints of every type and 2.4 billion robocalls per day, the best that has emerged is possible blocking of calls from numbers that could not exist. So far, though, the burden is mostly on the consumer, with the best suggestion ‘white-listing’ those you want to hear from (really?) and blocking the rest – or paying for a smartphone app. Despite lawsuits and judgments against carriers and scammers, the burden for stopping or preventing is on the consumer. No wonder we hesitate to answer the phone. Permalink Submitted by Laurie Miller (not verified) on Fri, 08/24/2018 - 09:50. TeleCalm is a great solution to the phone scam problem!